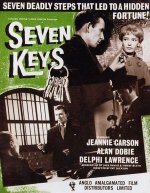 Alan Dobie plays a convict who is bequeathed a set of seven keys by a fellow prisoner. After discovering that the deceased was an embezzler who stole £20,000 that was never recovered; he sets out to find the cash after finishing the last three months of his sentence. However he must first solve the mystery of which locks the keys fit, and run the gauntlet of the police and a number of gangsters who are after him and the money.